Crouching Tiger and Hidden Dragon are traditional Chinese concepts that refer to energy waiting to be unleashed... there being no better way to describe Hong Kong of today! The excitement, exotic contrasts and 5,000 years of Chinese tradition combined with 150 years of colonial influence... the magic and mystique are unsurpassed. Hong Kong was occupied by the UK in 1841 and on July 1, 1997, the territory of Hong Kong reverted back to Chinese sovereignty - after over 150 years under British rule. No trade barriers, clear regulations and the free flow of capital - remain the same. 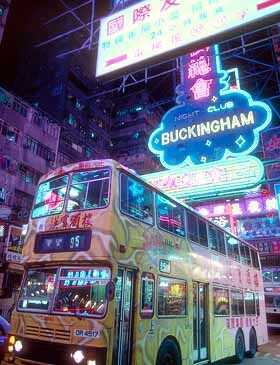 The hustle and bustle of Hong Kong continues and no better destination more suited to fulfill your travel demands for business and/or pleasure. Hong Kong International Airport ushers you to the gateway of Asia is only 23 minutes from Hong Kong Central. There is a population of more than 6.86 people living in Hong Kong, making some districts among the world's most densely populated areas. The Mass Transit Railway is fast, clean, efficient and inexpensive. The water from government mains satisfies UN World Health Organization standards and bottled water is widely available. Chinese and English are the official languages and Cantonese is the most widely spoken Chinese dialect. Most people in the service industry speak English. 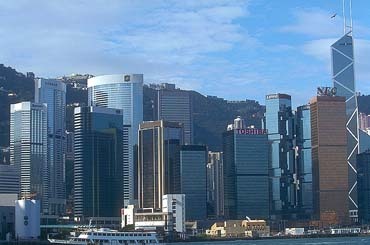 Even though visas are not required by U.S. passport holders to visit Hong Kong, they are needed to visit Mainland China. 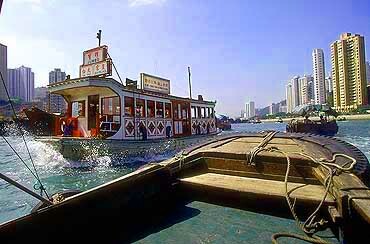 Hong Kong is situated on the southeastern coast of China reaching out over 424 miles with more than 260 outlying islands. Hong Kong offers shopping so varied - from the street vender selling silk apparel to the giant super malls with literally hundreds of shops. Local street markets offer songbirds to fresh flowers and/or fish. There are outlet stores, Asian artifacts offered in antique shops and jewelers crafting treasures of gold, jade and pearls. Most shops stay open seven days a week and late into the night. Cultural and amusements activities range from the Ocean Park to Museums and Galleries displaying a history of heritage dating back thousands of years. From scuba diving, golf, horseback riding and nature trails - the possibilities are unlimited. You may even hop a ferry to visit one of more than 260 outlying islands. And dining... Hong Kong offers a fusion of East and West as varied as one could possibly imagine. There are restaurants in every corner of the city and 6 well known eating districts. Hong Kong offers some of the world's finest hotels to accommodate the most discerning traveler. You will find a wide range of hotels that offer amenities from spas and acupressure to Rolls-Royce limos awaiting your call. There are also small hotels that specialize in family-style hospitality at competitive rates. It's all happening in Hong Kong. Come to the land where you may learn the secrete of the delicate balance of Yin and Yang.